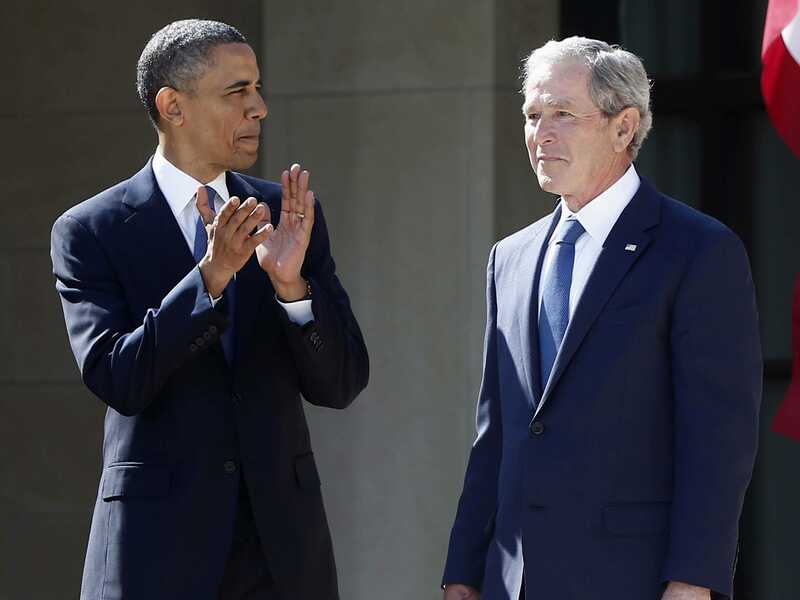 AP/Charles DharapakPresident Barack Obama stands with former president George W. Bush at the dedication of the George W. Bush presidential library. Former President George W. Bush has a simple explanation for why he almost never criticises his successor: He feels it undermines the office of the presidency. In an interview that aired Thursday night on Fox News’ “Hannity,” Bush insisted he would not attack President Barack Obama even though he continues to have strong opinions about national politics. “I don’t think it’s good for the country to have a former president undermine a current president. I think it’s bad for the presidency for that matter,” Bush said, according to video posted by Mediaite. Bush, who is currently promoting a book about his father, “41: A Portrait of My Father,” also said he had no interest in generating headlines for himself after serving in the country’s highest office for eight years.